The water was up significantly again yesterday as well as having a decidedly dirty twinge to it.Despite these less than favorable conditions , I got this boy to go. He took me to the rodeo and I used all my skill,fast footwork and wading abilities to land him. He fought exactly like a fish of this size and condition should fight......lights out! He stayed in the water for the most part,jumping only once,but tried to leave the pool on several of his powerful runs into the main current. The strength of some of these early fish rivals any I have encountered. Maybe summer will show up soon,on this river............... it could still be awhile. Over the last year I have been fortunate enough to be able to have dinner with one of the legends of fly fishing here in the Northwest, Trey Combs. This weekend you can meet him and the rest of the grungy old dogs from the Steelhead Underground. Stop by the Drift on Main Street in Klickitat, Washington on Saturday July 23rd and meet him in person. You will even find Klickitat has a great new coffee shop filled with steelhead and trout flies. Trey will be there having lunch and signing a few books between 10am until 2pm. 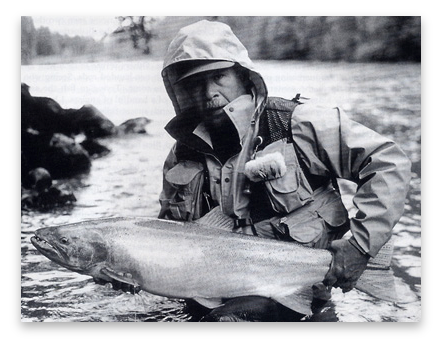 This is a great opportunity to pick his brain about steelheading and atlantic salmon fishing around the world. Hell I hear he also knows a thing or two about those saltwater creatures on the fly as well. I had the opportunity to mix a little business with pleasure this week. I actually had legitimate work looking at the transmission corridor that runs above the North Umpqua from Soda Springs to Dixon. Rugged country is an understatement. I hiked in to the lines behind Bogus Creek Campground and looked at a section that had been worked recently by the tree crews. I took a shot or two from this unique perspective of a couple of classic runs. So after I got my exercise in stomping around in the hills, I of course had to wet a line......DUH! At this time of year when the water is still so high, I try to think like a fish. Where would I be if I were swimming up this ditch? The popular spots right now are the easy spots to fish and thus everyone is in them. I avoided those places and went to an old familiar spot in the lower river. There was no way I would get out to the heart of the run but I could make it out to a pretty stable area and cast a longer line and cover most of the juicy stuff. I had been fishing a skater earlier in the evening, but my intuition told me sink tip. I stripped out some line to get beyond the boil from the rock we usually stand below. I made one cast and pulled it in"I didn't like that"I said, and set up for another slightly longer version . This second cast was a total train wreck, the line landed with more squiggles than a bowl of spaghetti, along with a huge belly being sucked in and held by the eddy from the rock. Basically the worst cast and placement of a fly as I possibly could have done, just terrible......and then the line went tight and a healthy fish grabbed my misplaced offering and headed for the back door. After a quick but spirited fight, I landed a chrome hatchery hen of about 8lbs. I should have given her the rock shampoo but traveling on the road early the next morning,did not bode well for fish retention at this time. I gave her a reprieve and she swam away strong. I fished a couple more spots, switching back to a dry line and skater on my new switch rod. As I find the button with this rod, I enjoy it more and more. I am fishing an 8 wt Rio Steelhead line on a 7110 Red Truck and I fish it mostly with one hand. It likes a high hard stop and that is what takes some getting used to, arm strength wise for sure. It roll casts like a dream and I just like fishing the longer floating lines on a rod like this. A very good North Umpqua rod if you can master the technique to wield it. I'm working on that, always pushing myself to fish the way I like to fish not always what is easy or popular. Anyone can take a skandi head and chuck it a mile.....not so with the setup I fish. I will be working on it till I am an old man for sure. Feeling pretty good after having a little action, swinging some skaters around etc.I again went to a spot that was just barely coming into decent shape. I started in way up high wading out to a spot I could get into a little of the deeper water in the main flow. I again opted for a tip in this situation, I just felt confident it was the right thing to do here as well. I fish drylines most of the summer and in these levels have no problem putting a light tip and unweighted fly through to just get into that mid water column. I worked my way down into the lower end just enjoying the run and the rhythm of casting and swinging. I was throwing a nice line and the drifts were on auto pilot. I was getting a slow swing into an area that holds a lot of winter fish as well. The water clarity was good enough to see why they liked it in here. A fast outside current with a mix of plate rock and basketball and bigger sized rocks just inside of that. A great place for a fish to move through quick or rest and hold. I was about at the end of my casting and wading limit but had enough for a couple more before I called it. I make a nice cast and it hits and starts to swing, tap,tap,tug,tap,tug, I wait for the line to tighten but nothing, tap,tug,OK that's enough of that,time to SLAM THE DOOR! I set the hook after what seemed like an eternity, not knowing for sure if waiting was the right thing to do. I haul back on the rod and half expect the fish to be gone, just a nipper and I missed him, but no, positive vibrations come from the other end as I find myself tied fast to another fish in this short evening outing. This fish is big, wild and not very happy with me. He runs hard and fast all over the pool. I can barely keep up with him. He swims right at me and I struggle to gain line back and keep good tension. He sulks out in front of me but I know he is far from done. I pressure him from the side to get him to budge, he resists and slowly heads out to mid current. I again try to put the wood to him and he pauses for a second and momentarily comes towards me and then he bolts. In the span of 10 seconds he jumps four times, ripped off all my running line and 30 or 40 feet of perfectly good backing. He jumps two more times and makes another run for the tail but I am having none of that. I duke it out with him for another minute or two and get him up to a rod length away and the hook pulls free and he slowly swims off, the victor in this battle. I like it when I don't have to touch them.The ending for me on this night was a perfect ending to a perfect day. And I worked all day too! I don't need to land all of them. Some ask me if I count the fish I don't land.....some people have different ways of counting things. A big,wild, North Umpqua buck steelhead at the peak of his strength that just gave you a ride you wont soon forget......I say it counted, oh boy did it count! I spent a brief few hours on the river and it was awesome as always. The water is still unseasonably high and it appears it will be that way for a while. We are probably about a month off our normal snow melt schedule and as frustrating as it is for wading and fishing, it is a good thing. Water level is close to a 1000 cfs above normal for this time of year. That's a lot of water folks. Looking longingly at favorite runs in the ledge rock that are no doubt holding fish and not being able to reach the casting position was a humbling experience. I am comfortable wading on this river and get to many places before anyone else tries, but I had to admit I was beat.No mater how hard I looked at a spot and rationalized how I could make it to the casting station, the river said "Nice try Skippy, not today!" A little later,as I was trying to get to a spot I had no business going, I fought with the river,I challenged the river to a duel. My passion to get to where I knew fish were holding was clouding my better judgement. I ignored the voice in the back of my mind that said " You're pushing it dude" The river again said "I don't think so" and to emphasize the point, a powerful surge almost took my legs out from under me as I foolishly exceeded my wading limits. I moon walked out of danger and sheepishly headed for the bank. Things can happen so quick in this water and I realized that as much as I wanted to be in control, I was not. There were hidden dangers and forces under this seemingly tranquil surface.I was reminded once again that the river demands respect, no matter how well you know it. It was a good gut check, I should have been swimming, I DESERVED to be swimming. After looking at,and fishing many of my usual early high water spots, I decided to fish a more popular spot. In fact one of the few places you could wade without swimming, thus the popularity. I watched as 5 or 6 people filtered through the run. Finally, the run was mine, in fact a series of runs were all mine as the groups of anglers that seemed to be everywhere were suddenly gone. It was 7 pm July 7 and the river was mine. I love it when that happens! Even though this particular run had been fished multiple times, I was confident that no one had actually made the proper drift to elicit a grab.I started in at the top of this very tricky run that has no less that 4 different speeds of water. Very fast water at your feet, medium current speed just out from that, a slow almost dead middle seam and a very fast outside current. The trick here is to get your fly to swing in the slower middle current where the fish hold without letting the line get yanked out of there by the close fast current. You need to use the fast speed of the outside current to help straighten things out, then hold line up over the close fast current and raise the the rod, lean and grit your teeth to get a long drift before the inside current catches things and rips it out of there. Line manipulation and management are crucial or you never get a drift anywhere slow enough for a fish to eat it. I start busting some string out and am now casting in the 80ft range. The drifts are sweet. The fly swims slowly in the middle section in perfect drifts and everything feels good. 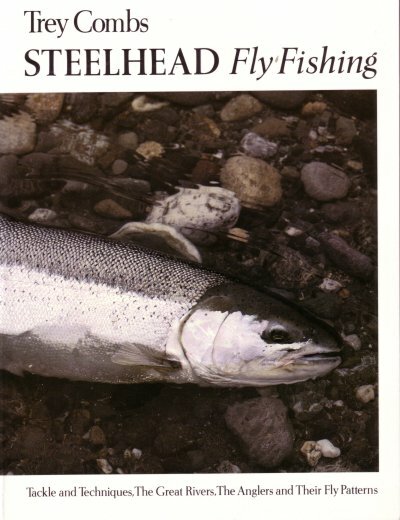 The line tightens agonizingly slow as the head shakes of a very lively summer steelhead start to transfer their wave lengths up the line and through the rod. The rod suddenly corks as the fish turns into the fast water and heads out the back end of the run, getting ready to show me some kite string. As the reel sizzles and my mind fizzles, I try to comprehend what has just happened in the last 30 seconds. The first fish of the year is always a surprise and this was no different. I let the reel spin, not comprehending that I could palm it to slow the fish down. Total mind meltdown as my instincts are not fine tuned like later in the year.And then without warning and as fast as it was on, it was off. It just inexplicably came unpinned. Why does this happen? Who knows and who cares! I just hooked a North Umpqua wild summer run that cleaned my clock and left me shaking and I was loving every second of it,about 45 seconds to be exact. I cranked in my line and looked around. Deserted. No one anywhere in one of the most storied sections of water in all of steelheading. I let out a small whoop as I let the excitement of what just happened wash over me. That feeling will never get old. The feeling of being tethered to a wild swimming creature that you just fooled with a hunk of feathers, with nothing more than a flimsy buggy whip and some string is something you can't describe to people. The water is high, and the fish are few but if you get out there you just might have an experience that will soothe your soul. A very easy way to manage a lot of running line(60ft+) with little or no hassles. Notice the hand flip and the second coil is reversed to avoid tangles. Shooting Line from Alan Maughan on Vimeo.